se_cryptosuite is SciEngines graphical user-interface for se_decrypt. It provides an intuitive way to manage work-queues and the specifics for individual analysis processes. Variations for addressing specific requirements of large-scale users are possible. 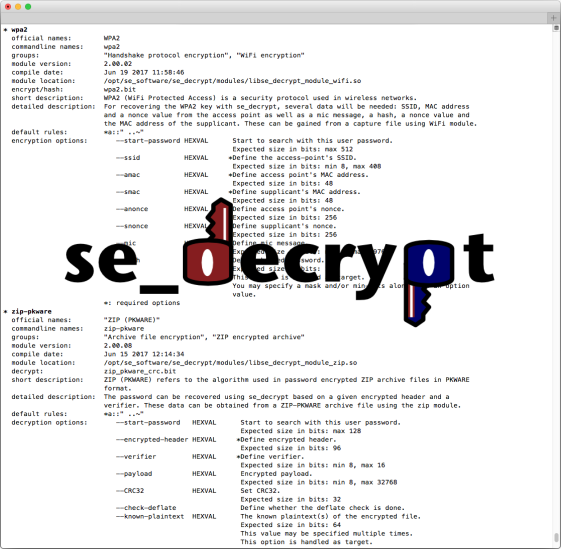 se_decrypt is SciEngines main cryptanalysis framework. It provides the functionalities required for effective large-scale processing such as keyspace distribution, resume-point setting, rules setting, dictionary loading and similar. Usability features allow the specification of encrypted files, containers or packet captures that are then automatically scanned for the information necessary for further processing without manual input from the users. Since se_decrypt interfaces with the scalable RIVYERA API but can also be run in a standalone mode, can be deployed on all system-sizes from small and mobile setups to large-scale clusters with thousands of FPGAs and even systems without FPGA-acceleration can run se_decrypt.